Planes are filled with more customers today than ever before. The American Heart Association says that about one-third of Americans are obese, and airlines have wasted no time in creating regulations that keep pace with expanding waistlines. Today, most flights are full, resulting in cramped, uncomfortable air travel, particularly for plus size passengers. The actual size of airline seats is shrinking, the space between them has been getting smaller and smaller. To make things more confusing, not all seats on the same airplane are the same size or price. Advocacy group Flyer Rights has noted that the average width of airplane seats has been reduced from 18.5 inches to 17 inches. The average pitch (legroom) between seats has decreased from 35 inches to 31 inches, and in some aircraft, the pitch is as little as 28 inches. The FAA does not regulate the size or design of seats, leaving this up to the airlines. As a general rule, seats in the last row in front of the bathrooms are narrower and you cannot recline; bulkhead seats typically offer more legroom. For an additional charge, some airlines offer premium economy tickets. Benefits vary from airline to airline, but one thing that doesn't vary is that these seats always cost more money. To find out about aircraft seating maps, dimensions and seat reviews on 800 airlines, check out SeatGuru. The website is part of TripAdvisor and they even offer an app for your phone. Many airlines have instituted strict obesity regulations to ensure the comfort and safety of all their passengers. American, United, Delta, Southwest and many other carriers define an obese person as someone that does not fit into a seat with both armrests down, intrudes on the seat next to them, and cannot buckle their seatbelt. If you are flying United, you must fit into the seat with both armrests down, not intrude on the seat of the passenger next to you and be able to buckle the seatbelt. The average length of a seatbelt on United is 25 inches depending on the type of aircraft you are flying. If you do not meet the criteria, it will be necessary for you to purchase an additional seat or upgrade to a different seat in order to board. Southwest requests that larger passengers voluntarily purchase a second seat when they buy their ticket to make sure the flight is not overbooked. Customers of size that book seats in advance can apply for a refund even if the flight oversells. If you purchase an extra seat in advance, Southwest refunds the cost of your extra seat; this process takes time and paperwork but is well worth it. Boarding agents on any leg of a Southwest flight have the authority to mandate the purchase of a second or third seat. If the agent at the gate determines a second or third seat is needed, the passenger will be accommodated with a complimentary additional seat if available, even if it has not been pre-booked. The general rule on American is that if a customer's body extends more than one inch beyond the outermost edge of the armrest and that a seatbelt extender is needed, then another seat must be purchased. If you reserve two seats in advance, make sure they are next to each other. American also offers options for upgrades that may provide more space and cost less than purchasing two seats. Delta's policy states that if you cannot sit in your seat without encroaching into the seat next to you and if you cannot put the armrest down, ask the flight attendant to reseat you next to an empty seat. Another option is to purchase an upgrade to business or first class. A final option is to purchase an additional seat. JetBlue's "Even More Space" offers larger seats and legroom; the pitch is up to 38 inches. Another bonus is that you can board early giving you advanced access to overhead bins. Overweight people are required to purchase an additional seat. If they do not have one, they will not be permitted to board the flight until they purchase one. 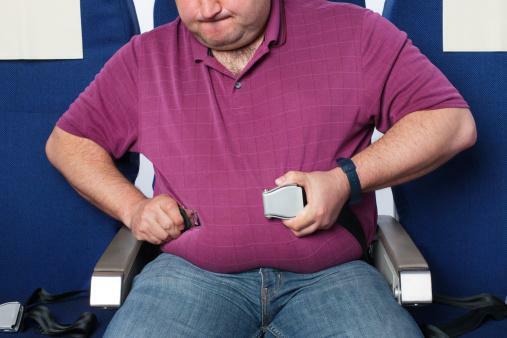 At one time, overweight passengers could bring a seat belt extender from home. Currently, the FAA does not allow the use of passenger-supplied seat belt extenders because they are not inspected and maintained by FAA regulations and standards, and as such, they are considered unsafe. This regulation includes all seat belt extenders on the market, including those that are marked "FAA" approved; they aren't. Seat belt extenders must be provided by the airline. When booking your flight, ask if you can reserve a seat belt extender for your flight. Barring that, befriend the gate attendant to ask for vacant adjacent seats, as well as the seat belt extender. The final recourse is to ask the flight attendant for an extender prior to boarding. Once you have selected your flight, check the type of plane that will be used to reach your destination before you make your final decision. 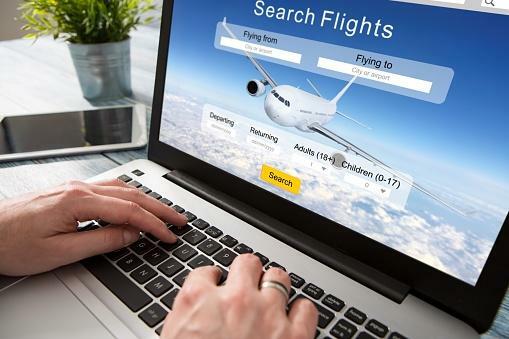 Once you know what type of plane you are flying, check and compare airlines on SeatGuru for specific information on the cabin, seat layout and size, and the amenities offered. It is also a good idea to check the website of the airline you want to book. The most convenient or discounted flight may not be the most comfortable for plus size passengers. Plan ahead and research your options to make sure you have a comfortable flight. Fly when flights are not heavily booked. Tuesday, Wednesday and Thursday flights are best. Midday, late evening or overnight flights tend to be the least crowded too. Avoid connecting flights. Direct flights keep you from having to walk through the airport to find the gate of the second flight, get resettled in a second seat on a second flight, and run the risk of your seat assignment being changed on the second leg of your flight due to a change in plane models. Some airlines allow coach passengers to purchase seats with more legroom and wider seats, but they have to pay an additional $50 or more. The space available in an airline seat is based on three factors: the width of the seat to accommodate hips, the location of the seat in the row to accommodate shoulders, and the pitch, which is the amount of space between the rows for legroom. Seat width in economy coach varies from about 17-18". The pitch (legroom) varies from about 31-34". Larger planes, such as a 767 or 777, generally have wider seats and more legroom. Business class and first class usually have wider seats and more legroom; however, the armrests usually contain the tray table and can't be raised. The tray table may be unusable if you are not able to raise it high from the armrest to fit across your lap. Small planes such as turbo-props tend to have narrower seats and reduced legroom. The first row of seats (the bulkhead) and exit row seats usually have the most legroom. The backs of the seats in the last row of the plane do not recline. If you are making an online reservation and you are not able to select your seat online, call the airlines reservation agent immediately to reserve your preferred seat. One week before the flight, be sure to call the airline and confirm your seat assignment. Make sure that the aircraft type and/or your seat assignment has not been changed. If you have booked two seats, remember to confirm that the seats are next to each other. On the day of your flight, check-in online to see if you can change your seat assignment to a more comfortable location. For example, many airlines do not assign the seats in exit rows or behind the bulkhead until the day of the flight. Every airline has an overweight passenger policy, and passengers are required to accept the policy if they want to board. Since each airline has its own policies in regard to how to get a larger seat, what upgrades are available and how to apply for a refund, airline passengers of size should know the policy of the airline prior to travel.